This natural wonder is located on the Oregon Coast. It’s approximately twenty feet in diameter and about fifteen feet deep. Water enters through the bottom with an incredible amount of force and then shoots upward to heights of twenty feet, it quickly recedes down the walls and back out to sea before another large wave hits. I have been here four times and never seem to walk away with dry clothes. I always come back to this image. 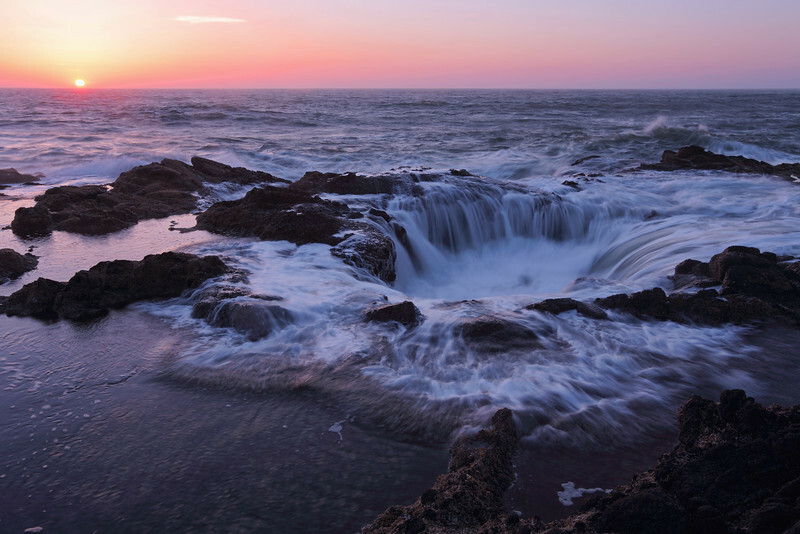 When we were in Oregon, I had wanted to photograph Thor's Well, but I was just too timid to try to get down there. My loss. Beautifully composed long exposure capture! This is amazing to me on two levels. First, just for the image itself. Second for the fact that as many times as I have vacationed in Yachats, I've never heard of Thor's Well. I've seen some surge channels along the rocky coast there that force up great gouts of sea water, but this one is new to me. I really like the comp. Thor's Well could stand alone but the sun on the horizon just knocked it up a notch. Very nice. Amazing shot! I love the colors and the water movement!